Enjoy your vacation without any worries! 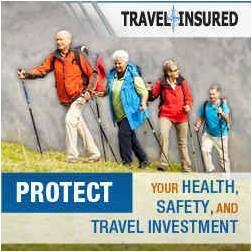 We highly recommend purchasing travel protection. A policy with our partner, Travel Insured, will make sure that you will be protected when the unexpected happens: last minute trip cancellations, early returns home, lost luggage, or illness while traveling. When purchasing travel protection with Travel Insured you will be able to travel with peace of mind. If you are part of a group tour, please download our Group Tour Travel Protection brochure.